The first part of UNBREAKABLE KIMMY SCHMIDT season 4 just came out, but Netflix is already looking ahead. “I think the tone of the show feels set,” co-creator Tina Fey told reporters at the show’s Television Critics Association panel. She noted people have told her they watch the show with their teens/tweens, so to alter it now would jeopardize that. But there is one freedom the producers are thrilled to have: flexible run times. Network needs had their original season 1 cuts coming in at 20 minutes and 15 seconds, and Fey noted it would often take two days to shave the episodes down to that length. Now, they’ll have the freedom to go beyond that. 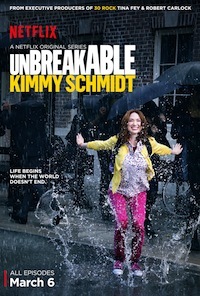 UNBREAKABLE KIMMY SCHMIDT — the new comedy from 30 ROCK bosses Tina Fey and Robert Carlock about a woman (Ellie Kemper) who is released from a cult and attempts to make a new life for herself in New York City — was originally intended to air on NBC, but then things took a turn: in late November, it was announced that Netflix would be running the already-shot first season, and the streaming service had also picked up a second season.